You know, there are other ways to get rid of your child’s school projects without dumping them in the trash. Not interested? Close your browser now. You can take their precious pictures and have them write a note on the back. Slip it into an envelope (it’s OK to fold the picture) and send it to a relative or friend! They will love getting this one-of-a-kind art and perhaps even more sweet than that . . . they will love seeing your child’s handwriting and knowing that they were being thought of. You’ll become their favorite. And I know you secretly want that. You can also frame it and give it as a gift. This is in our bathroom downstairs. Well, I took it out for the picture (in case you were wondering). We have a ducky theme going on in that bathroom so when one of my children came home with this artwork, I knew exactly what I wanted to do with it. I bought a frame, trimmed it slightly to fit better in the frame, and framed it. 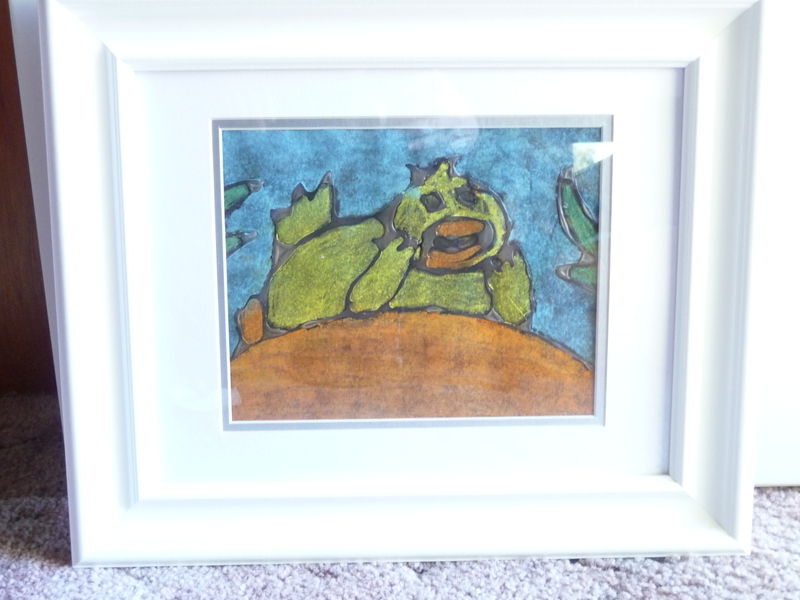 This entry was posted in Back to school, Organizing and tagged children's art, framed art, gifts, school projects. Bookmark the permalink.